Styling is similar to the Leoncino 500. Engine is likely to be borrowed from the Benelli 752S. Chassis appears to be all-new. Comes with dual petal discs upfront with radial callipers and dual-channel ABS. Production version expected next year. Will rival the Ducati Scrambler 800 & Triumph Street Scrambler. 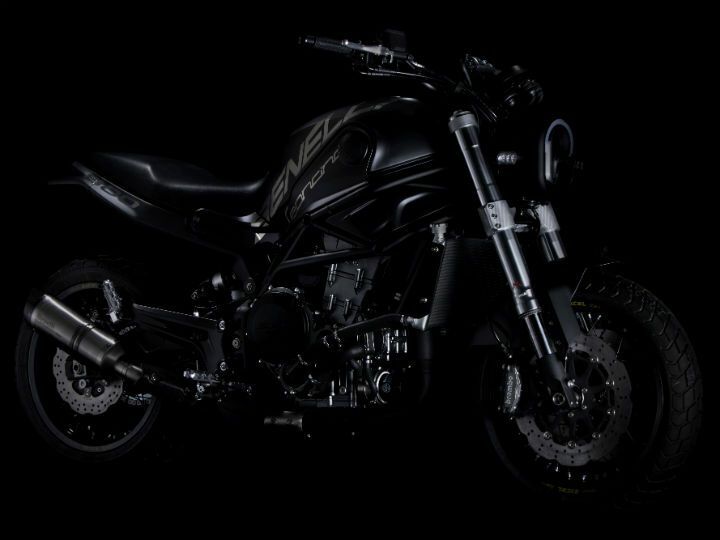 Benelli has taken the wraps off its latest scrambler concept, the Leoncino 800, at this year’s EICMA in Milan, Italy. The production version of the motorcycle would be the biggest Leoncino, displacement-wise. Expect Benelli to launch the production model at EICMA next year, pitting it against the Ducati Scrambler 800 range and the Triumph Street Scrambler. The motorcycle’s design language is in line with the Leoncino range. You get an oval headlamp a la the Leoncino 250, butch fuel tank, single-piece seat and a short tail section. The sculpted seat and the easy-to-reach handlebars suggest comfortable ergonomics for both on- and off-road purposes. The trellis frame looks different when compared to the Benelli 752S, and could’ve been designed specifically for this motorcycle. Nestling inside the frame is a liquid-cooled engine that’s likely to be borrowed from the 752S and looks the same too. While Benelli has not revealed the power and torque figures for the motor in its new state of tune, the 754cc inline twin-cylinder DOHC unit on the 752S produces 76.8PS at 8500rpm and 67Nm at 6500rpm. Back to the Leoncino 800 Concept, the engine works in conjunction with a 6-speed transmission linked to a chain drive. Apart from the frame, the swingarm and the rear monoshock also appears to be new. The former is likely to be an alloy unit. Up front, the inverted forks look just like the 50mm Marzocchi forks seen on the 752S. Brakes include a twin petal disc setup with radial callipers up front and a disc at the rear, with dual-channel ABS. The Leoncino 800 Concept rolls on blacked-out spoke wheels shod with block-pattern tyres. I'm looking for an excuse not to buy the xsr or ducatti scrambler, especially in price point vs performance. I'm looking for an excuse not to buy the xsr or ducatti scrambler, especially in price point vs performance. Share your experiences with Leoncino?